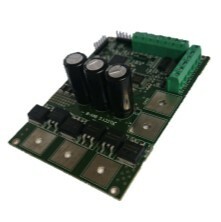 The challenge with this particular project was to develop a higher current version of the ZDBL15 sensorless brushless motor controller whilst retaining a similar compact footprint. In addition, the unit was required to work exceptionally well at low temperatures and required extensive custom programming in order to deliver the hard start required for the particular application. One of the most important challenges with this particular application was the tight envelope in which the controller was required to fit. This was initially designed to work with the ZDBL15 sensorless brushless motor controller, so adding additional current handling in the same basic footprint was especially challenging. This meant designing the board in such a way as to allow it to fit neatly around key obstacles but still perform the most important job of delivering high performance motor control. An important challenge in the development of this application was developing a controller which could get over the initial static friction of the application. This is something which is relatively straightforward in closed loop applications but especially difficult in sensorless brushless motors. In order to address this, the controller was designed with exceptionally robust components. The programming was then extensively fine tuned in order to ensure a smooth transition on startup, despite the high inertia. A critical customer requirement with this particular controller was that it be able to work in environments as low as -40C. Care was therefore taken to ensure all components used could meet this specification and that they would still perform optimally when called upon. Perhaps the single biggest challenge relating to this low temperature was the impact it could have on the hard starts. As the lubrication in motors begins to freeze this places even more load on the controller during the startup phase. However, with careful optimisation we were able to deliver the required performance. Perhaps the most important lesson from this particular project was just how much can be done with sensorless motors. We would be lying if we said that the startup phase of operation was not something which caused us a headache during development, especially at the lower temperatures, but the resulting performance proved that it can be done. The sense of satisfaction from designing a controller to such tight specifications is especially rewarding and seeing the final product pass all of it’s extensive tests was something we were especially pleased about.